She sits in her electric wheelchair, twitches her face and forces a smile. You can easily tell that her mind is busy at work, trying to mask the pain. After a few more twitches, the smile comes out and she boldly declares that she has since moved on, she has accepted to let bygones be bygones. The story of Prudence Mabhena is a teary one, even without regard to the fact that she was born basically unable to help herself in any way. So, when Roger Ross Williams stumbled upon her story and decided to do a documentary about her life, especially that Prudence was leading the eight-piece afro-fusion band comprising disabled members, she thought that, maybe, her sorrows were about to be a thing of the past. And the documentary, Music by Prudence, went on to win an Academy Award, commonly known as an Oscar, whereupon she was carted from Bulawayo to the bright lights of Los Angeles for the awards ceremony, rubbing shoulders with Oprah Winfrey & Co along the way. From the dusty and hot valley that she calls home in Victoria Falls, there she was on the international stage, her name being mentioned in the same sentences as Sandra Bullock (The Blind Side), Mo'Nique (Precious), among other Oscar winners that night. After the cocktails, the red carpet, the interviews and the photo shoots, it was time to leave for home. And as the world prepared for another season of Oscars the following year, then another,, and then the third one, Prudence was slowly erased from the world's memory and very few now remember that she was the subject of an Oscar-winning short documentary in 2010. "I tried to engage Roger, soon after the Oscars, inquiring if I shouldn't get any financial rewards for being the subject of the documentary. From my research and what I saw in Hollywood that night, the Oscars are a big deal and naturally I felt I should get something out of it. But Roger was very straightforward and said that he was the owner of the documentary . . . and that there was nothing for me. "I argued that I was the subject of the documentary, which he said he was fine with but that he HAD the documentary in his pocket. It was his. And since then I haven't heard from him . . . I have even deleted his phone number from my contacts," she said. From that distance, her eyes could be seen getting teary, not so sure if it was the blowing wind as the interview was in open air or it was all emotions, 2010 playing out before her eyes. Tapiwa Nyengera, who doubles as the public relations officer for Liyana as well as King George Memorial School, which is the school where the band was born, said immaturity and ignorance of the law played a part in what befell Prudence and Liyana Band. "When these guys came we were still very young and didn't know what it meant to sign a contract, so we just put pen to paper. It was only after the Oscars that we got to read our contracts to find out if we had been duped and when we took the contracts to our lawyers we found out that they were drafted using American law, and even seeking recourse could have been expensive for us." The story of Prudence and the Oscar that she never won will remind many of the furore that surrounded Slumdog Millionaire, the Indian-based film that won eight out of 10 Oscar nominations in 2008. Rubina Ali (who played youngest Latika) and her little co-star, Azharuddin Mohammed Ismail (youngest Salim), thought they were on the threshold of a luxurious lifestyle when they were plucked from the slums of India by director David Boyle. But despite the film grossing over US$300 million, the two youngsters' lives were not changed. Besides coming from a complicated family set-up, Prudence's first challenge was not being accepted by her parents, initially. "When my mother gave birth to me, my father immediately divorced her because he could not accept my condition. And my mother went on to marry and I could not go with her into her new marriage." She is grateful, though, that she was given the chance to live. "In some other cultures, and even ours (long back that is) they would kill children like me soon after birth. But I am grateful that I was given that chance to live and live my dream. Today I am a motivational speaker and have been to countries all over the world telling parents and children to accept their conditions. Education is the key to accepting disability and if my parents had been educated enough about disability I don't think they could have treated me the same way they did." Though Prudence and her band might be bitter about being short-changed on the Oscar fortune, they are, in a way, happy that the Oscar somewhat helped put them on the world stage. Their road to fame started after winning the Music Crossroads provincial finals in 2006, from where they proceeded to Marondera for the national finals where they came third. As a prize, they went to compete in Mozambique in the Southern Africa finals, where again they came third. Again, as a prize they went on a tour of Europe and, for between five and six weeks, they criss-crossed Sweden, the Netherlands and Belgium. "We just felt luck was raining on us that time," explained Nyengera, "such that we named our first album Liyana, which means it is raining." The second album, Sugar Rhythms (for sweet things must have been flowing by now) was to come three years later, coupled with a six-week tour of America. The tour included performances and workshops. It was that tour which was to redefine the band further, as three members, Goodwill Nzou, Energy Maburutse and Honest Mupatsi were to get scholarships to study in the States, where they are currently. "So that explains why we have been quiet as a band this while, we lost three members and we are re-grouping. We have been trying to identify who can fill their slots and it is looking good, so very soon, probably sooner than you can think, we will be going into the studio for our next project," explained Nyengera. Though Liyana has been on a hiatus, so to speak, Prudence has not been. She went into the studio and in April this year released her eight-track solo gospel album, Ithemba Lami. "There has been speculation, when I released my solo album, that all was not rosy within Liyana, but that is not the case. We are still a family and it is only the departure of our colleagues for their studies that has seen us taking a break. Soon we will be hitting the road again. In fact, we are doing live performances as we speak and those who want us to perform for them are welcome." 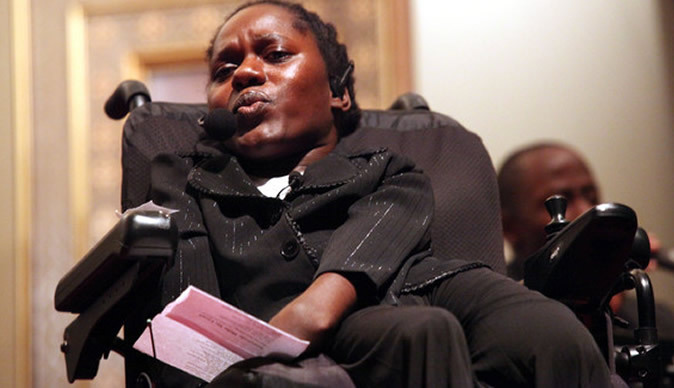 Besides being disrupted by the departure of her three colleagues, Prudence has had to take time off, some six months, in 2011 to undergo spinal surgery in the US. "From January to June 2011 I was away having spinal surgery and naturally I took a break from music." And the misery that has always been her life was to manifest itself a month or so after arrival from the States. "It was July 19, I remember it vividly. I was on the phone, being told that my father had passed away, and another call came through and went on call-waiting. When I picked it up after receiving the news of the death of my father, the caller was informing me of the death of my brother. They died at about the same time, on the same day. It was devastating, to say the least." Prudence says she holds no grudge against her mother, who is staying in Botswana. When her mother met and married her father, she already had a son (the one who died the same day as her father). She re-married and had three other children. After her mother was divorced, her father re-married and had three children. "So from my father's side we are four and from my mother's side we were five and altogether, you do the maths," she laughed it off. And these are the life experiences that have made her strong, that she talks casually and jokingly about disability, and that has made her a strong character, hence a good and well-travelled motivational speaker. For someone who has faced such adversity in life, does she have time and space for love? "I am single . . . single and scratching."